All of the United States' 50 states have a state motto, as do the District of Columbia, and 3 U.S. territories. A motto is a phrase intended to formally describe the general motivation or intention of an organization. State mottos can sometimes be found on state seals or state flags. Some states have officially designated a state motto by an act of the state legislature, whereas other states have the motto only as an element of their seals. The motto of the United States itself is In God We Trust, proclaimed by Congress and signed into law by President Dwight D. Eisenhower on July 30, 1956. The motto E Pluribus Unum (Latin for "One from many") was approved for use on the Great Seal of the United States in 1782, but was never adopted as the national motto through legislative action. 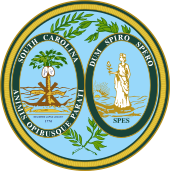 South Carolina has two official mottos, both of which are in Latin. Kentucky, North Dakota, and Vermont also have two mottos, one in Latin and the other in English. All other states and territories have only one motto, except Guam and the Northern Mariana Islands, which do not have any mottos. English and Latin are the most-used languages for state mottos, each used by 25 states and territories. Seven states and territories use another language, of which each language is only used once. 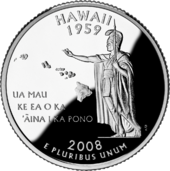 Eight states and two territories have their mottos on their state quarter; thirty-eight states and four territories have their mottos on their state seals. The dates given are, where possible, the earliest date that the motto was used in an official sense. Some state mottos are not official but are on the official state seal; in these cases the adoption date of the seal is given. The earliest use of a current motto is that of Puerto Rico, Johannes est nomen ejus, granted to the island by the Spanish in 1511. ^ "History of 'In God we Trust'". U.S. Treasury. Archived from the original on 2009-02-28. Retrieved 2009-02-27. ^ a b "Seals, Flags, House & Senate Emblems". State of South Carolina. Retrieved 2009-04-10. ^ a b "Kentucky's State Symbols". Commonwealth of Kentucky. 2008-01-29. Archived from the original on 2008-12-22. Retrieved 2009-02-07. The Latin motto was adopted by HB 857 and is defined by KRS 2.105. ^ "State Coat of Arms". State of North Dakota. Archived from the original on 2016-09-26. Retrieved 2016-10-02. ^ a b c "Escudo de Puerto Rico" (in Spanish). Government of Puerto Rico. Archived from the original on 2011-06-26. Retrieved 2011-04-10. ^ "Official Alabama Motto". Alabama Emblems, Symbols and Honors. Alabama Department of Archives & History. February 13, 2008. Retrieved 2009-02-06. ^ "State Symbols". State of Alaska. Archived from the original on July 18, 2008. Retrieved 2009-02-07. ^ Sorensen, Stan; Theroux, Joseph. "The Samoan Historical Calendar, 1607-2007" (PDF). American Samoa Government. p. 57. Archived from the original (PDF) on 2008-06-26. Retrieved 2009-03-07. ^ "Arizona State Seal". State of Arizona. Archived from the original on 2009-06-10. Retrieved 2009-02-07. ^ "History of the Arizona State Seal". Arizona Secretary of State. Archived from the original on 2009-02-11. Retrieved 2009-02-10. ^ a b "The Great Seal of Arkansas" (PDF). State of Arkansas. Retrieved 2009-02-14. ^ a b "History and Culture - State Symbols". State of California. Retrieved 2009-02-07. 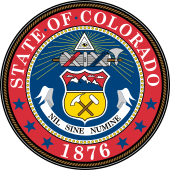 ^ "Colorado State Archives Symbols & Emblems". State of Colorado. Retrieved 2009-02-07. ^ "Sites, Seals & Symbols". State of Connecticut. June 9, 2008. Archived from the original on 2010-12-10. Retrieved 2009-02-14. ^ "Delaware Facts and Symbols". State of Delaware. 14 August 2008. Retrieved 2009-02-07. ^ "About District of Columbia". District of Columbia. Retrieved 2009-02-07. 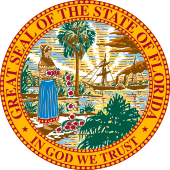 ^ "What is the state motto of Florida?". State of Florida. Archived from the original on 2012-07-19. Retrieved 2009-02-07. 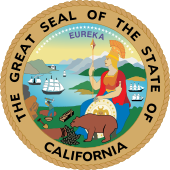 ^ "State Seal". State of Georgia. Archived from the original on 2014-05-24. Retrieved 2009-02-14. ^ "Georgia State Symbols". State of Georgia. Retrieved 2009-04-10. ^ "Hawaii, the Aloha State". State of Hawaii. 2009-01-14. Retrieved 2009-03-02. ^ a b "Hawaii State Motto". NETSTATE.COM. Retrieved 2009-02-15. ^ "Idaho's State Motto" (PDF). Idaho State Historical Society. March 1970. Retrieved 2009-02-07. ^ "Seal of the State of Illinois". State of Illinois. Archived from the original on 2009-01-31. Retrieved 2009-02-15. ^ "Emblems" (PDF). State of Indiana. Retrieved 2009-02-07. ^ "Iowa State Symbols". State of Iowa. Archived from the original on 2010-04-30. Retrieved 2009-02-07. ^ "Kansas Seal". State of Kansas. Archived from the original on January 29, 2009. Retrieved 2009-02-07. ^ "Kids' Page". State of Louisiana. Retrieved 2009-02-07. ^ "Emblems". State of Maine. Archived from the original on 2009-05-10. Retrieved 2009-02-07. ^ "Maryland State Seal - Great Seal of Maryland (reverse)". Maryland State Archives. State of Maryland. April 21, 2005. Retrieved 2009-02-14. ^ "Maryland State Seal - Great Seal of Maryland". Maryland State Archives. State of Maryland. June 17, 2004. Retrieved 2009-02-14. ^ "Massachusetts Facts". Commonwealth of Massachusetts. Retrieved 2009-02-10. ^ "History of the Great Seal". State of Michigan. Retrieved 2009-02-14. ^ "State Motto". State of Michigan. Retrieved 22 August 2010. ^ a b "Minnesota State Symbols". State of Minnesota. Retrieved 2009-03-02. ^ "State of Mississippi Symbols". State of Mississippi. Archived from the original on April 29, 2009. Retrieved 2009-02-10. ^ "The Great Seal of Missouri". State of Missouri. Retrieved 2009-02-10. ^ "About the State Seal". State of Montana. Archived from the original on 2009-02-05. Retrieved 2009-02-10. ^ "State Seal". State of Nebraska. Retrieved 2009-02-10. ^ a b "Nevada Information". State of Nevada. Archived from the original (PDF) on 2009-01-30. Retrieved 2009-02-10. ^ "State Emblem". New Hampshire Almanac. State of New Hampshire. Retrieved 2009-02-10. ^ "The Great Seal of the State of New Jersey". State of New Jersey. Archived from the original on 2009-01-15. Retrieved 2009-02-10. ^ a b "Great Seal of New Mexico". State of New Mexico. Retrieved 2009-02-10. ^ "New York State Flag and Great Seal of the State of New York". State of New York. March 31, 2008. Retrieved 2009-02-10. ^ "The State Symbols". State Library of North Carolina. State of North Carolina. 2009-01-22. Retrieved 2009-02-07. ^ "State Motto". State of North Dakota. Archived from the original on 2009-02-11. Retrieved 2009-02-10. ^ "House Bill No. 1346". State of North Dakota. Retrieved 2013-02-27. ^ "5.06 State motto". LAW Writer Ohio Laws and Rules. State of Ohio. Retrieved 2009-02-10. ^ "Great Seal of Ohio". Ohio History. Ohio Historical Society. Retrieved 2011-04-10. ^ Everett, Diana. "State Emblems". Encyclopedia of Oklahoma History and Culture. Oklahoma Historical Society. Archived from the original on 2009-06-15. Retrieved 2009-06-05. ^ "Grand Seal of the Territory of Oklahoma" (PDF). Chronicles of Oklahoma. Oklahoma State University. Retrieved 2009-06-05. ^ "History of Oklahoma Emblems" (PDF). Chronicles of Oklahoma. Oklahoma State University. Retrieved 2009-06-05. ^ a b "State Motto Timeline". State of Oregon. Archived from the original on 2007-08-10. Retrieved 2009-02-10. ^ "Symbols". Pennsylvania Historical and Museum Commission. Commonwealth of Pennsylvania. Archived from the original on 2009-01-22. Retrieved 2009-02-10. ^ "Description". Welcome to Puerto Rico. March 16, 2009. Retrieved 2009-04-10. ^ "State Symbols". State of Rhode Island. Retrieved 2009-02-10. ^ "Signs and Symbols of South Dakota". State of South Dakota. Archived from the original on 2008-02-20. Retrieved 2009-02-10. ^ a b "Tennessee Symbols And Honors" (PDF). Tennessee Blue Book. State of Tennessee. Retrieved 2009-02-10. ^ "Texas State Symbols". Texas State Library. Retrieved 2009-02-10. ^ "Great Seal of the State of Utah". State of Utah. Archived from the original on 2009-03-31. Retrieved 2009-04-05. ^ "Utah State Motto and Emblem". State of Utah. Retrieved 2009-02-07. ^ "491. Coat of arms; crest; motto and badge". 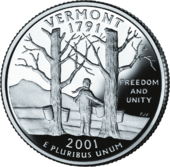 The Vermont Statutes Online. State of Vermont. Retrieved 2015-04-10. ^ "S.2" (PDF). Vermont Legislature. Archived from the original (PDF) on 2015-04-16. Retrieved 2015-04-11. ^ Thurston, Jack (10 April 2015). "After Confusion and Controversy, Vermont Gets New Latin Motto". NECN. Retrieved 11 April 2015. ^ "State Symbols, Seals and Emblems". Commonwealth of Virginia. November 12, 2008. Archived from the original on January 15, 2009. Retrieved 2009-02-10. ^ "Legislative Seal". Legislature of the Virgin Islands. Archived from the original on 2008-12-16. Retrieved 2009-02-15. ^ a b "Symbols of Washington State". Washington State Legislature. Retrieved August 16, 2018. ^ "State Seal of West Virginia". State of West Virginia. Retrieved 2009-02-14. ^ "Wisconsin State Symbols" (PDF). Wisconsin Blue Book. State of Wisconsin. Archived from the original (PDF) on 2009-02-27. Retrieved 2009-02-14. ^ "Great Seal". Wyoming Secretary of State's Office. Archived from the original on 2008-11-27. Retrieved 2009-02-14. Shearer, Benjamin F.; Shearer, Barbara S. (2002). State Names, Seals, Flags, and Symbols (3 ed.). Greenwood Publishing Group. ISBN 978-0-313-31534-3. Retrieved 2009-02-15. This page was last edited on 10 April 2019, at 02:38 (UTC).